Elaina's had lots of questions lately. Can I have candy? Why can't I watch Calliou? How does the Tooth Fairy know you lost a tooth? Why does she want all those teeth? How does the baby get out of mommy's tummy? Oops! Round 4 of that question! Nice to know I can still field the questions openly and honestly. Her next question, "Does it hurt when the baby comes out?". I answered yes but not too much and then you have a sweet little baby to love. Her reply, "I'm going to adopt a girl from China." For Elaina, of course, this leads to further discussion of how she came to be my little girl and me be her mommy. She seemed to have a good understanding of the complex story how her tummy mommy in China, who loves her very much, foster mom, Ayees (aunties/nannies at the orphanage) and Mommy all have a part in bringing her home. Pondering this for a moment, she asked, "Did Ricky come out of your tummy?" Yes he did. "Did Daniel come out of your tummy?". Yes, that's right. "And James came out of your tummy?" Yes. Later that day, Elaina proudly presents me with a drawing. See below! I exclaimed "Ooh, how pretty" as this was the first time I was drawn with hair and then asked what the drawing was about. I had a pretty good idea but wanted to hear it from the artist herself! 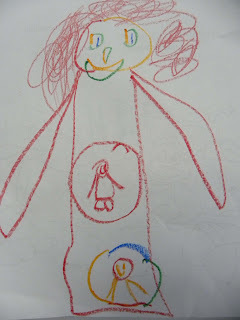 She explained this is a picture of me (mommy) with TWO babies in my tummy. I naively ask, "Two babies?" "Who are the two babies?" Victoria is on top and Elaina, herself, is on the bottom. She further explained that she is on the bottom so she could come out first because she, Elaina, was so hungry! 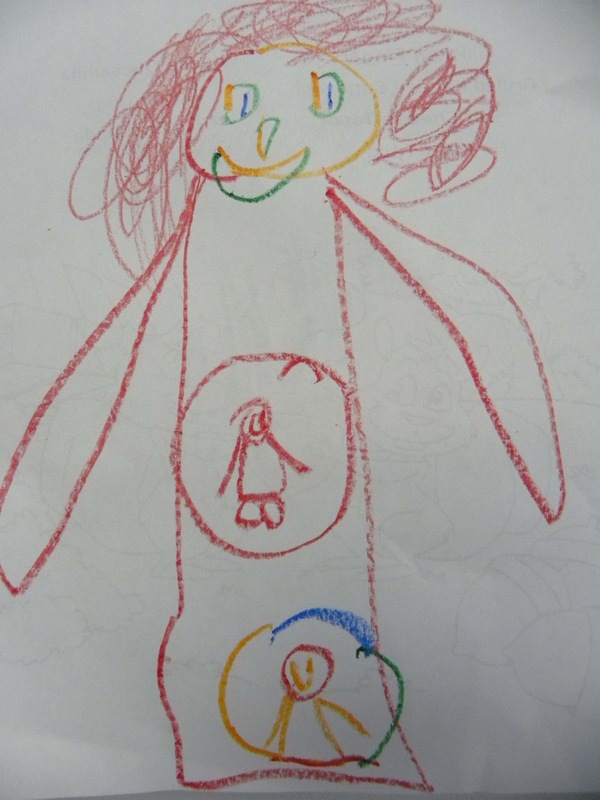 I'm not sure what the professionals might say about this drawing but I'm going with the idea that Elaina is attaching firmly to us as her parents and that she is particularly gifted in the medical science of obstetrics! So, I salute the future genius of the Medical Arts, Elaina Xin May Stephens! Mommy loves you, Peanut!